Here’s a checklist to start preparing for “Back to School”. But, most of us probably have less than 2 months before school starts. That’s ok just skip ahead on this list. This list will help you remember all the little details that go into getting “Back to School”. 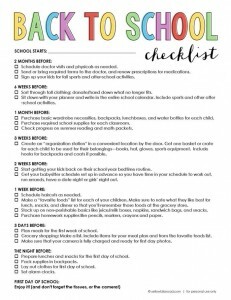 Click here to get this FREE Back To School Checklist Printable from Yellow Bliss Road.